(Photo: © Brian Brown/Beer in Big D). Among the more than 20 brewery or brewpub openings to happen in North Texas over the last two years, only one occurred in Fort Worth. That drought was relieved a bit this weekend, however, with the debut of Cowtown Brewing Co. in the northern section of the city. Founded on the idea that "great beer deserves equally great barbecue," the barbecue aspect of the business may still be a few days away, but Cowtown's beer began flowing on Friday night. A mix of German classics, IPAs, and off-the-menu stouts made up the opening day menu, providing patrons with a mix of modern and traditional styles. Large batch selections included Rhinestone Cowboy (German kölsch), Sim City IPA (DDH IPA brewed with Simcoe hops), The Last Kaiser (imperial märzen Oktoberfest) and my personal favorite, Spalt Bier (German altbier brewed with Spalt hops). Two additional double dry-hopped IPAs made up the small batch section of the menu, with Amarillo On My Mind (DDH IPA brewed with Amarillo hops) said to be a best seller. Beyond those beers, co-founder and head brewer, Shawn Kidwell, says he's got a double IPA and a doppelbock currently fermenting in the tanks. Naturally, those fall into the company's short-term plan, while things like fruited sour beers (targeted to pair with barbecue desserts) and barrel-aged offerings are items in the works for further down the road. best of both to folks in Fort Worth (Photo: © Brian Brown/Beer in Big D). "We're kind of figuring out how to work within our space right now, but long-term we'll get into sour beers and barrel-aging," says Kidwell. "For sour beers, I want to be careful and make sure we keep things isolated, and for our barrel program to work we'll probably have to make the barrels part of the decor." Cowtown's beers are draft-only for now, but the brewpub's setup provides it with the ability to offer up to twelve beers on tap from the bar. A can seamer is also installed on site, allowing customers to grab beer to-go in the form of 32-ounce crowlers. Regarding an official welcoming event, that's likely to take place a few weeks after Cowtown gets the smoker out back fully up and running. "We wanted to get open as soon as we could, just to work out the kinks and get everything in order," says Kidwell. "Once we're settled on both the beer and barbecue side, we'll schedule the grand opening party. So, come in now for the beer, but come back for the barbecue!" 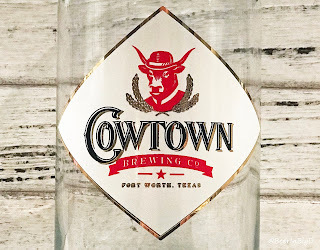 Going forward, Cowtown will be closed for brewing operations on Mondays and Tuesdays, but open for business during the latter part of the week. Posted hours are Wednesday-Thursday, 11 a.m. - 10 p.m., Friday-Saturday, 11 a.m. - 12 a.m., and Sunday 11 a.m. - 10 p.m.